Blake joined Cub Scouts in first grade. Since then, Tuesday nights have been our dedicated Scout night. 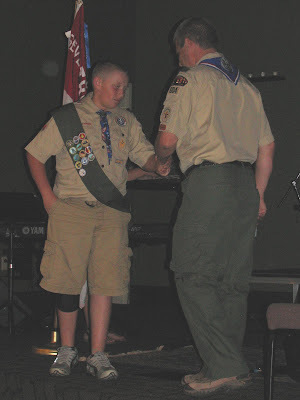 18 months ago, Blake moved up to Boy Scouts and we are amazed at the change it has made in his life. He's become so much more responsible and really matured a lot. Last month, at his Troop's Court of Honor, he was awarded SEVEN merit badges and that he had worked towards and completed over the summer. We were so proud of all of his hard work. Blake is also a Patrol Leader and Historian for his Troop. It's hard to believe that one month from today our boy will turn 13. Where does the time go?